We have received 58 reviews of Girls Can't Hit . You can add a review or scroll down to read reviews. To send in your review of Girls Can't Hit , please fill in the info below and click the button labelled Send Review Now. Reviews will be checked by our team before they appear on the website. Your last name will not appear on the site, but we need to know who you are in case you win a prize! 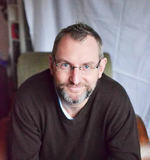 Tom Easton writes lots of books for all ages and under different pseudonyms. His children’s books include Boys Don’t Knit, Pirate Pals and Our House. His adult books include Resonance, Hav3n and Seven Second Delay. Subject matter covered in these and his other books includes teenage agony aunts, vampires and pandemics (but not all in the same book). In 2015, Boys Don’t Knit received a Carnegie Medal nomination as well as being shortlisted for the Leeds Book Awards. There are a few things Fleur Waters never dreamed she’d find herself doing…. Life is full of surprises and so, it turns out, is Fleur. This is a warm and witty story about friendship, feminism and throwing the perfect punch! As well as being an author, Tom’s other job is to be a production manager for United Kingdom publisher Hachette Children’s Books. He is married and lives with his wife, their three children and two cats in Surrey in the South of England. I thought this book was amazing! The meaning of it was really important, and this book was really enjoyable to read. I would recommend this book to a friend! Poppy gave Girls Can't Hit 5 out of 5 and now plans to read Welcome to Nowhere by Elizabeth Laird. I think this book is fabulous, because it is interesting and original. I like it because it shows girls can rebel. Alenia gave Girls Can't Hit 5 out of 5 and now plans to read Ink by Alice Broadway. GIRLS CAN HIT IS AN AMAZING BOOK . I LIKE IT BECAUSE IS A REALLY INTERESTING BOOK AND SHOWS THAT GIRLS ARE STRONG. SARAH gave Girls Can't Hit 5 out of 5 and now plans to read The Extraordinary Colours of Auden Dare by Zillah Bethell. The book is really nice because it is interesting and even though girls can hit in reality. This is also representing what actually happens in real life. One thing that is that there is a lot of feminism even though i am a girl it is over pressuring boys. G gave Girls Can't Hit 4 out of 5 and now plans to read I Have No Secrets by Penny Joelson. This is a great book about feminism and stereotypes that aren't true. I really enjoyed this book. Ellis gave Girls Can't Hit 5 out of 5 and now plans to read Ink by Alice Broadway. Being a feminist, I found this book amazing. From the style it's written in to the lighthearted comedy, this book was an all rounder. marlie gave Girls Can't Hit 5 out of 5 and now plans to read Dragon's Green by Scarlett Thomas. Personally I love martial arts, always have, so as you probably guessed I really liked this book. Fleur has a strong will to become a boxer. To me she has particularly strong willpower to continue to box even though she was the only girl in the club, despite being kicked out after using it for self defence in the middle of the story, I think the author did a great job with this book to motivate girls that consider martial arts training. Anna gave Girls Can't Hit 4 out of 5 and now plans to read Dragon's Green by Scarlett Thomas. I really liked this book. It was a bit boring at times as it is a bit anti climatic but the overarching themes of feminism and boxing are good. I would definitely recommend this book. Madeleine Beth gave Girls Can't Hit 4 out of 5 and now plans to read Dragon's Green by Scarlett Thomas. I enjoyed Girls can't hit because of its message that is "change is good" and I think it was relatable as you can apply it to anything and that if you want something you've got to work for it. I think the main thing that conveyed this to me was how she fell and felt exhausted but picked herself up and persevered and kept going. She changed her diet exercised more and kept going even though her mother and boyfriend George don't approve. This book was really brilliant, I think it had a great message and some funny comedy. William gave Girls Can't Hit 4 out of 5 and now plans to read Welcome to Nowhere by Elizabeth Laird. Jacob gave Girls Can't Hit 4 out of 5 and now plans to read I Have No Secrets by Penny Joelson. I loved this book!! !It is an amazing feel-good book and really shows that anyone can do anything and I really liked how well that message is put across in the book. This book will undoubtedly make anyone who reads it laugh-out-loud on many occasions which is hard for an author to achieve. This book was very inspirational while also just being a really good book! I'd definitely recommend it. Kaitlyn gave Girls Can't Hit 5 out of 5 and now plans to read I Have No Secrets by Penny Joelson. Jasmin gave Girls Can't Hit 5 out of 5 and now plans to read I Have No Secrets by Penny Joelson. Jake gave Girls Can't Hit 4 out of 5 and now plans to read Ink by Alice Broadway. Qianye gave Girls Can't Hit 5 out of 5 and now plans to read Dragon's Green by Scarlett Thomas. i enjoyed this because it was funny and it had a great story also i loved the sarcasm at the beginning. cian gave Girls Can't Hit 4 out of 5 and now plans to read Ink by Alice Broadway. I thought that the character of Fleur was quite empowering, although this clearly was not enough to compensate for the lack of anything interesting. WOW what a boring book!I got half way through and was able to guess the ending. AMBER gave Girls Can't Hit 2 out of 5 and now plans to read Welcome to Nowhere by Elizabeth Laird. Girls can't hit is a surprising book with many events happening that you don't expect. Sometimes I feel parts of the book do not need to be in the book and take away from the story as a whole. The characters feel like a member of your family that you can always understand and know what they are going through. I also like the extra addition of parents arguing over the smallest things. Ben gave Girls Can't Hit 4 out of 5 and now plans to read Dragon's Green by Scarlett Thomas. I think this book shows that girls and boys both have the rights and to do the same as each other. It also shows that gender stereotypes shouldn't get in the way of you doing anything. This book shows Fleur's journey in her sport and how she succeeds. Harriet gave Girls Can't Hit 4 out of 5 and now plans to read Ink by Alice Broadway. I thought that this book was really cool.I really enjoyed the parts where they were doing boxing and fitness but the parts about feminism were still very interesting. Emily gave Girls Can't Hit 3 out of 5 and now plans to read I Have No Secrets by Penny Joelson. What I liked about this book is that I wanted to read more. However, I thought that the characters could have been explained in greater depth. Also, there were quite a lot of boxing terms which I sometimes didn't understand. Those parts did get boring but maybe that's just because I'm not into boxing. Even so, I wouldn't normally read a book like this and from reading other reviews on this book, I wasn't expecting much from it. Despite this, I did enjoy it. Ellie gave Girls Can't Hit 3 out of 5 and now plans to read I Have No Secrets by Penny Joelson. This book has a realistic outlook on young adult life and includes lots of interesting opinions and explains lots about friendship and boxing. A ok read but it could be improved. BOB gave Girls Can't Hit 3 out of 5 and now plans to read Welcome to Nowhere by Elizabeth Laird. Girls Can't Hit really effected me as a person because of the all the obstacles that the main character had to overcome. I feel as though the author really tried to address a problem with how sexist people can actually be. To me Girls Can't Hit was a really great read that set an example of how to over come obstacles by putting in your all. I hope that the author continues to set an example with his story's in the future! Charlie gave Girls Can't Hit 5 out of 5 and now plans to read Ink by Alice Broadway. Girls can't hit. People say this all the time... but their wrong. Fleur started out as an unfit teenager who was not competitive person and definitely not a fighter, but her life turned when she started to box. Blossom and her are part of a feminist group against the "meninists", blossom didn't seem to like the idea about fighting but fleur is keen. She soon fits in with all the boys and the accept her. She moves on with her life despite everything around her. Truly inspiring to the reader and motivating. It made me want to take up boxing once again. It shows how boxing doesn't have to be a dangerous sport and you can make it safe. It also shows how you can push yourself. AND REMEMBER, KEEP YOUR GUARD UP. Natasha gave Girls Can't Hit 5 out of 5 and now plans to read Dragon's Green by Scarlett Thomas. Girls Can`t Hit, that has to be true right? Wrong. Girls CAN hit and Fleur Walters is here to prove it. She`s sick and tired of all the sexist comments from the menisits. Fleur quickly fits in with all the boys and she even encourages other women to join, even if that means Bonita Clark. Will Fleur prove that girls can hit. This book was incredibly empowering and should be read by all girls who need some empowerment. It is well written and inspiring. It shows boxing in another light and how the coaches do care about the safety of their boxers. Helen gave Girls Can't Hit 4 out of 5 and now plans to read The Extraordinary Colours of Auden Dare by Zillah Bethell. Girls can't hit is a funny story and shows the results you can get if you work hard. I agree that Fleur is a role model as she didn't give up on doing something just because it was difficult. I think it was very good that Fleur decided to not bother with what her family thought or what they told her. Sam gave Girls Can't Hit 4 out of 5 and now plans to read Welcome to Nowhere by Elizabeth Laird. 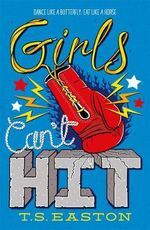 Girls can't hit is a funny book based on feminism and boxing. The main character is Fleur Waters, she is a stereotypical young adult with a very normal life. One day one of her friends takes her to a boxing club to protest. Fleur joins the club and loads of amazing things happen to her because of that witch turns her world upside-down. My problem with this book is that it trys to cram lots of different styles of writing into one book and it is quite a lot to take in but overtime I got used to it. Alfie gave Girls Can't Hit 3 out of 5 and now plans to read Dragon's Green by Scarlett Thomas. I really liked this book because it was funny and interesting. I would recommend this to reads. its about fleur waters and her 2 best friends and there journey to success and is very relevant to life. this would not usually be something I would pick put I really enjoyed it! carys gave Girls Can't Hit 4 out of 5 and now plans to read I Have No Secrets by Penny Joelson. I enjoyed the drama in this book and also the interesting vocabulary used to capture the reader's attention . This book is good to teach young students about sexism and how you can deal with it. Ian gave Girls Can't Hit 4 out of 5 and now plans to read I Have No Secrets by Penny Joelson. This is a good book. It takes a while to get the story going but once you are far enough into the book it is really good. The book has many dilemmas and can make you very tense. It is very feministic and it is great for anyone who is interested in boxing and feminism. It also has a bit of boyfriend drama and family drama mixed in the plot. Overall it is a really great book. Emily G gave Girls Can't Hit 3 out of 5 and now plans to read Dragon's Green by Scarlett Thomas. this book was a very good read and very exciting. i loved how it was about women's rights and how girls should be allowed to box. it has inspired me to push to my limits to get to my goal in life and that you should never give up, no matter what is going at home or at school. i loved it and definitely recommend it as one of the best books. isabel gave Girls Can't Hit 5 out of 5 and now plans to read I Have No Secrets by Penny Joelson. I really liked this book because it was really funny, interesting and I would definitely recommend it. It is about a girl called Fleur who loves boxing and you can see her journey to how she succeeds her dream. I would definitely recommend this book to anyone who likes books about adventure, friendship and boxing. Annika gave Girls Can't Hit 5 out of 5 and now plans to read Ink by Alice Broadway. this is an amazing book. very interesting and sporty. This book Is about dedication and doing something you never really thought you would do. So far this book is the best book I have read! Tanisha gave Girls Can't Hit 5 out of 5 and now plans to read I Have No Secrets by Penny Joelson. Anna gave Girls Can't Hit 5 out of 5 and now plans to read The Extraordinary Colours of Auden Dare by Zillah Bethell. Hifza gave Girls Can't Hit 5 out of 5 and now plans to read The Extraordinary Colours of Auden Dare by Zillah Bethell. I would like to start this review with definition of feminism. Feminism is trying to get equal rights for men and women. This book constantly tries to say it is a feminist empowerment but it does nothing but irritate me with its agenda that seems to want a matriarchal society. Also the book is lazily written and follows a very predicable plot. From around 5 chapters in you can tell how the book ends. I also think that the humour is forced and relies too heavily on sarcasm and character tropes to make people think the book is funny. It's not. Sam gave Girls Can't Hit 1 out of 5 and now plans to read Ink by Alice Broadway. Girls Cant hit is warm and witty and, tough not a challenging read, wonderful to fill an otherwise boring 15 minutes and brighten up your day. I did find the character development was a little lacking though, making characters (such as Bonita) difficult to understand and others (such as Blossom) just downright irritating. However, for a book I wasn't expecting much from and wouldn't have picked up in any other circumstance it took me by surprise and left me satisfied and all chuckled out! Poppy gave Girls Can't Hit 3 out of 5 and now plans to read Welcome to Nowhere by Elizabeth Laird. This book is amazing! before i started reading it i didnt think that i would enjoy it as much as i did. i highly recommend this book as i found it very enjoyable.The book is very inspirational, warm and witty; i found it relatable in some ways and no so much in others.i think this is why i enjoyed it so much. its about girls being able to do what they enjoy and standing for whats right and what the believe. poppy gave Girls Can't Hit 4 out of 5 and now plans to read I Have No Secrets by Penny Joelson. Girls Can't Hit is a very warm book. It has a steady build up but progresses into a hilarious book filled with determination. Though I would not normally choose this type of book, it was not what I expected. I would highly recommend this to both boys & girls. An easy read. I found myself nodding my head to the parts when Fleur was told she can't do something and she pushes herself to. Maddie gave Girls Can't Hit 3 out of 5 and now plans to read Welcome to Nowhere by Elizabeth Laird. I think this book was, mostly, great. The storyline really made you want to read it all in one go as the key events were well timed. In my opinion there were two reasons that made this book sub-optimal, one of which is the ending as there wasnâ€™t really one. All that happened (that was necessary for the plot) was Fleur achieved the main goal of the story. The second reason is that I think there was superfluous boxing detail but you could ignore most of that. Aside those too pessimistic points I think it was a very creative and commendable book. oliver gave Girls Can't Hit 4 out of 5 and now plans to read Dragon's Green by Scarlett Thomas. I really enjoyed this book as you can see from how high I rated it. I really liked it because it had a really good storyline and created quite a bit of tension and that's what I like in a book, a cliff hanger. It also has a good moral in it, not to be sexist because girls and boys are equal. My favourite character was Fleur Waters because she is strong and respects her friendship and relationships with others around her. I don't really like boxing but this book really engaged me. Harneeka gave Girls Can't Hit 5 out of 5 and now plans to read The Extraordinary Colours of Auden Dare by Zillah Bethell. Unfortunately, this book was in able to capture my interests. It has quite a lot of boxing terminology that I was unable to relate to and, as I am not interested in sports, I didn't find it enjoyable. It has a strong backstory that involves heartbreak and powerful views on women's rights, although, I feel there could have been more written on that side of the story. Despite this however, the book was well written and could, at some points be quite powerful. If you enjoy reading about sport, then you will really enjoy this book. Olivia gave Girls Can't Hit 2 out of 5 and now plans to read Dragon's Green by Scarlett Thomas. I really enjoyed this book as it defies all gender stereo types when she finds out she is actually really good at sports. However I would recommend this to everyone above the age of 11. Taylor gave Girls Can't Hit 5 out of 5 and now plans to read I Have No Secrets by Penny Joelson. I felt the book had a great storyline and an interesting view on society, though it lacked a variety of character personalities as I found most of the men in the book had similar views on the sexism in society (they were either extremely sexist themselves or had little opinion/interest on the matter) and I feel it would have felt more realistic for the reader if personalities and opinions would have varied a lot more. Despite this I rate the book highly. Hannah gave Girls Can't Hit 4 out of 5 and now plans to read Welcome to Nowhere by Elizabeth Laird. I really enjoyed this book - I think the message that girls (and boys) can do exactly what they want to do, without being restrained by gender stereotypes, is really important. This was an important story about peer pressure and learning not to judge a book by its cover. I thoroughly enjoyed it and I'm sure my students will too. Miss Burns gave Girls Can't Hit 5 out of 5 and now plans to read I Have No Secrets by Penny Joelson. I think this book was an inspirational read, with the characters going through relatable problems and being able to overcome them. The book is centred around a teenage girl called Fleur who, despite all obstacles, was able to become a successful young boxer. However she had help to get there, with characters ranging from Blossom - a supportive friend and feminist to Pip - a shy individual. In conclusion I would recommend this book to everyone. James gave Girls Can't Hit 4 out of 5 and now plans to read Dragon's Green by Scarlett Thomas. I really enjoyed this book because it was great to see the characters grow and the plot progress. The author's style of writing was really enjoyable for me. I liked how it was relatable and light-hearted. It is a funny, empowering book for boys and girls. Tara gave Girls Can't Hit 4 out of 5 and now plans to read Ink by Alice Broadway. I think you should read this book because it has a few funny part and I give it a 5 star rating. I recommend it to teens that like good books. Melissa gave Girls Can't Hit 5 out of 5 and now plans to read The Extraordinary Colours of Auden Dare by Zillah Bethell. This was funny, weird and interesting how a girl like Fleur wanted to do boxing and this weirdly. I would say this book was amazing and outstanding! Arina gave Girls Can't Hit 5 out of 5 and now plans to read I Have No Secrets by Penny Joelson. This book was the first I read from the Leeds book awards shortlist and it was the best book to start from. This book not only shows that girls can do anything that boys can it also helps others to understand that girls are equal to boys. I really enjoyed this book and it also taught me how much effort and commitment it takes to train at boxing. I loved this book and recommend it to anyone. Zoya gave Girls Can't Hit 5 out of 5 and now plans to read Dragon's Green by Scarlett Thomas. It was a really supercalifragilisticexpialidocious book. I would recommend it to all of you. I choose it because I thought it would be interesting. It's all about a girl who can't do any sports and one day she finds one that she can do. Isma gave Girls Can't Hit 4 out of 5 and now plans to read Welcome to Nowhere by Elizabeth Laird. It was a good book...It had a powerful,clear message. Maria gave Girls Can't Hit 4 out of 5 and now plans to read The Extraordinary Colours of Auden Dare by Zillah Bethell. Bethany gave Girls Can't Hit 4 out of 5 and now plans to read Welcome to Nowhere by Elizabeth Laird. It is a very engaging book, I absolutely loved every bit of it! The thing that makes it interesting is the way that the text is written and the tone of it. Additionally, I absolutely adored Fleur's passion and resilience towards Boxing. This is a very inspirational novel, which encourages individuals to not give up and keep trying in order to achieve their goals. Atena gave Girls Can't Hit 5 out of 5 and now plans to read Welcome to Nowhere by Elizabeth Laird. I think that this was a very relaxed book, with battles being against stereotypes rather than actual people. It is about empowerment and feminism and has a great plot with sarcastic humour sprinkled through. I think that it has a perfect ending and I rate it very highly. Jem gave Girls Can't Hit 4 out of 5 and now plans to read The Extraordinary Colours of Auden Dare by Zillah Bethell. It was a very good book and it had a very clear message.I like the fact that it tells you that if you never give up yo can succeed. Anna gave Girls Can't Hit 4 out of 5 and now plans to read The Extraordinary Colours of Auden Dare by Zillah Bethell. Deia gave Girls Can't Hit 5 out of 5 and now plans to read Ink by Alice Broadway. I enjoyed this book because it's all about self-motivation and I want to encourage people to motivate themselves and achieve their best. My favourite character is Blossom because she is a feminist and I personally believe in what she believes. Blossom is a strong, determined character and will always do what she feels is right. I could connect to all characters. All in all a really great read, I would recommend it to everyone. Evan gave Girls Can't Hit 4 out of 5 and now plans to read Welcome to Nowhere by Elizabeth Laird. This is quite a decent book about feminism, and determination. It's very heartwarming and inspirational. The further I got into the book, the more I enjoyed it, so I'd encourage you to keep going with it. It is definitely a book for people of age 11-14 (the category it's in), as it isn't particularly hard to read, however it has some strong language in it. The only reason I'd say I didn't rate it 5 stars was because I found it a little too easy to read. I'm used to books that tend to challenge me, intellectually and with my endurance skills, but I found this book flowed into each part and then fit together nicely at the end. I'm not really into that, but many other people are, which I understand. In general, I think the book is good, but not great. Ella gave Girls Can't Hit 4 out of 5 and now plans to read Ink by Alice Broadway.